The TC 1000 R punching machine. TRUMPF has poured all its punching know-how into the new TRUMATIC 1000 ROTATION punching machine, available in Australia through Headland Machinery . 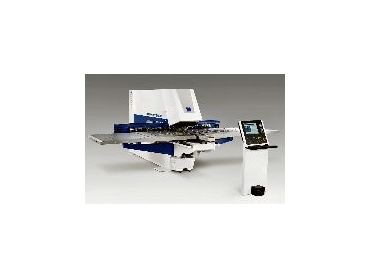 The compact machine has been designed as a beginner model for the bottom segment of the TRUMPF product portfolio, and paves a cost-effective way for beginners to enter the field of CNC sheet metal processing. TRUMPF has also introduced a completely new technology for punching machines - starting with the TC 1000 R - called "roller deburring". Behind this innovation, is a new feature that is the first of its kind in this form worldwide and with which TRUMPF plans to equip further punching machines. The principle of the new feature is simple: A special tool forms the burr into a bevel. Thus, burr-free edges are formed for the user. No longer having to perform manual deburring not only reduces the run-time, but also makes processing more cost-effective. A lack of burrs reduces the risk of injury. This innovative deburring process is ideal for all metallic materials, such as steel, stainless steel, and aluminum in sheet thicknesses of 0.8 to 2.5mm. With the introduction of the machine, a new software component makes programming easier, from creating the drawing, to manual sheet layout, to processing. This applies to all simple components which, according to a worldwide survey of TRUMPF customers, accounts for 80 percent of all punched parts. More complex components are programmed using ToPs 300 basic. The background to the enhanced software was the demand for an easy-to-learn program for which the user needed no previous knowledge. The idea is for customers to get their hands on a finished metal part quickly. Now they can intuitively program the software using the touch screen or keyboard on the machine control panel. All current TRUMPF punching tool technologies can be used on the TRUMATIC 1000 ROTATION. At 600 strokes per minute, the Multishear can be used for excellent edging work, as well as the Multibend for bending work, and Multitool, in which up to ten different punches can be integrated. Other examples are the particularly fast-working beading dies for cutting, stepping and adding beads. Also included are tools for extrusions, threads and formings. By using Multitool, the machine's linear magazine can take up to 150 tools. This tool enables the TRUMATIC 1000 ROTATION to shape any sheet into the desired form. The single tool adapter in the punching head rotates. This allows all tools to rotate 360 degrees smoothly. This feature means a minimised number of tools, and reduced setup costs, as well as a higher processing speed.